Pull up to the valet in a fully operational Lexus. The Lexus is known for its style, sophistication, and powerful engine. The manufacturers designed an exceptional vehicle that made you ready to impress the public the moment you drove it off the lot. Maintaining that excellence through the years on the road is on you (and us) though. Choose Precision Auto, an expert Lexus service team, to perform all of your Lexus maintenance services. You can trust us to handle your Lexus with the care and service expertise that it deserves. Our clean and consistent oil change services will protect your engine’s strong performance and longevity. Bring us any lube service, diagnostic services, tune-ups, and pre-purchase inspections to ensure safer road travel. The key to servicing Lexus breakdowns and repairs is avoiding them altogether. Even when you have a diligent service schedule, normal road travel can catch you by surprise. The Lexus is designed to keep you riding in style and comfort, not sitting on the side of the road in style and comfort. Precision Auto in Germantown, MD is not here just to perform emergency repairs. We’re here to make sure you don’t have them. But if you ever do, you know where to come for all the answers. We provide Lexus repair solutions that take care of today’s daily commutes, and tomorrow’s road trips. Pay attention to any warning signs and let our specialists have a look under the hood. For quality engine repairs, transmission repairs, brake repairs, exhaust system repairs, air conditioning repairs, steering and suspension repairs, and much more. Improve your Lexus driving experience by enhancing driveability, engine performance, and electrical system. Keep your Lexus on the road as the class of the highway, not the side of the road. Or the class of our service bay for that matter. You purchased your Lexus to be impressive on the highway. Our job is to make sure your vehicle stays that way. From the moment you purchased your Lexus, we should have been your next destination. Of course there’s nothing wrong with a new Lexus, but that’s not how you take care of a Lexus. You stay ahead of any repair needs with an effective maintenance service plan. Schedule Your Lexus Repair Service Today! Taking care of your Lexus is one of our specialties. 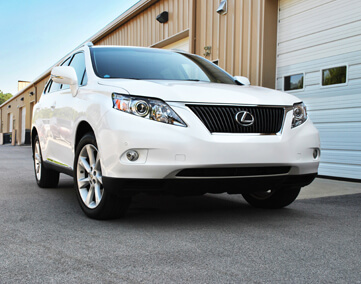 Precision Auto is a preferred repair facility for quality Lexus service. Our experts don’t treat the Lexus like every other vehicle. At our shop, it gets the specialized treatment it deserves. Give us a call today at 301-917-2682 to schedule your Lexus service appointment. No matter what condition your Lexus is in, it should keep its service schedule with Precision Auto. Use our convenient online scheduling system to go ahead and schedule your next appointment right now!